It is hot here and one thing that hot is good for is ripening tomatoes. Our daughter has been growing a lot of tomatoes in our town’s community garden. All sorts of types. She has some monster big ones, lots of cherry and grapes, and lots of heirloom species. Needless to say I am going to be highlighting lots of tomato meals. She had used a slice off one of the big ones for a BLT so I had the use of the rest of it. I boiled up some water for penne, sauteed onions and garlic, added some dried chile flakes and fresh oregano and when everything was ready combined everything with the cut up fresh tomatoes. That’s two vegan dinners in a row! 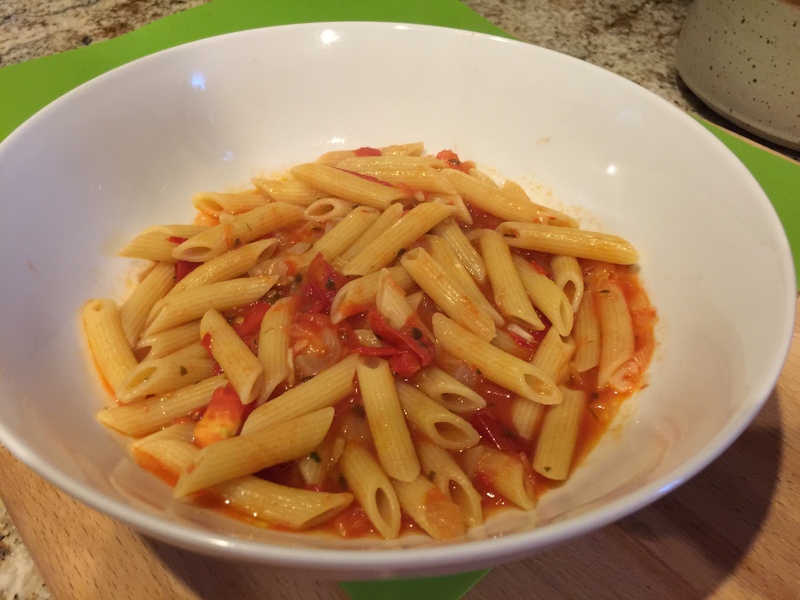 This entry was posted in Pasta, Vegan, Vegetables, Vegetarian and tagged garlic, Onions, pasta, penne, tomatoes, Vegan, Vegetables, vegetarian. Bookmark the permalink.